Volunteers plant a garden with CBF at Second Baptist Church of South Richmond. Photo Credit: Kenny Fletcher/CBF Staff. Sandwiched between bricks and asphalt, life flourishes in a quarter-acre patch of earth in Richmond, Virginia. Tomatoes ripen a deep red on undulating vines. Bees buzz among bright zinnia flowers collecting nectar to turn into honey. Okra pods reach toward the sky. It is a remarkable renewal for a space that until recently was a vacant spot alongside Second Baptist Church of South Richmond. Such abundance is surprising at first glance. But for Pastor Ralph Hodge, the church's garden has a deeply rooted connection to faith. "Many of the parables Christ used were about farming," said Hodge. "There are spiritual lessons related to the time you have to wait between sowing and reaping." Eden's Community Garden, as it is known, has allowed the church to contribute to the community and the environment in new ways. Now a year into their journey, the effort has blossomed. The garden provides fresh produce in a food desert—an underserved community with limited access to grocery stores. The project also uses practices that prevent rain from washing pollution off the church's parking lot and roof and into nearby streams. "People of faith, we need to be managing, nurturing, and protecting all life, from humans on down," Hodge said. "We have to be at the forefront of it. It's all connected." Since the garden was planted in March 2016, church members have grown more than 30 different types of fruits, vegetables, and herbs, from beans and bell peppers to squash and sweet potatoes. A beehive produces local raw honey, and church members make hot pepper jelly. This bounty is offered after Sunday service for a small donation that helps cover garden costs. Every Saturday morning during growing season, volunteers harvest, wash and package the vegetables for Sunday. It becomes a bonding experience, said Pat Harris, who managed the garden in its first year. "It's ladies telling stories and sometimes singing songs around a big round table while we pack vegetables," Harris said. "It is therapeutic. You forget about whatever else is on your mind." "What gets me excited is getting the church excited about vegetables," Harris said. After service, people rush to the vegetable table and line up to get first dibs on the vegetables, fruits, and herbs. Last summer they shared more than 1,250 bags of produce. Volunteers and Second Baptist Church of South Richmond congregation members work with CBF to create Eden's Community Garden. The church is located in a former Winn-Dixie supermarket, with an enormous parking lot and roof that together total nearly six acres. 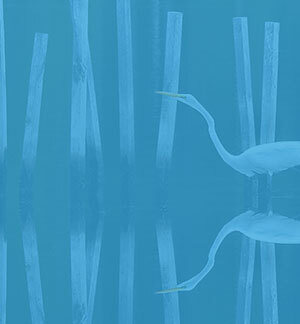 With so much area covered by hard surfaces, rainfall can easily wash off dirt, oil, litter, and other pollutants into nearby streams that drain into the James River. But that has changed since the project's completion. Rainwater running off the church's roof is captured in a 10,000-gallon cistern and is used to water the garden's crops. Runoff from the parking lot flows into a rain garden of native plants that holds and filters the water before it pollutes streams. The project is another example of how the EPA's Bay Program helps communities restore local waterways. It was made possible with Bay Program funding through a National Fish and Wildlife Foundation grant to the Chesapeake Bay Foundation. The church found inspiration for this holistic effort in Psalms 24: 1: "The earth belongs to the Lord, and its fullness, the world, and those who dwell in it." By feeding the community and improving local streams, Second Baptist is caring for God's creation, Hodge said. "Everything you've been given belongs to God. God is looking to you to manage it in a way that is healthy, beneficial, and helps everything," he said. "You don't care for things just for yourself. You do it so that everybody benefits." 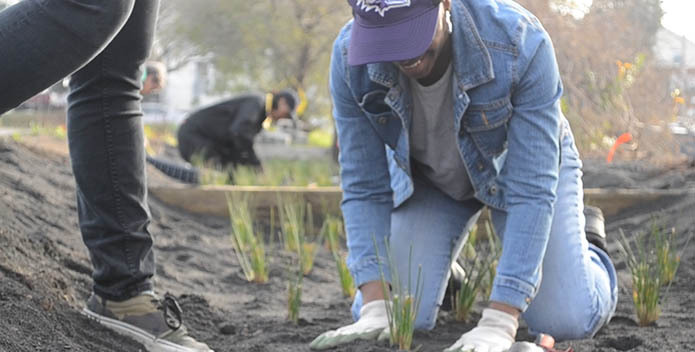 Because one garden can't feed the whole city, Second Baptist hopes this project will inspire others to do the same in their own homes or churches. "We talk a lot about food deserts. So it is important to put a plan in place to teach people how to grow food at home," Hodge said. 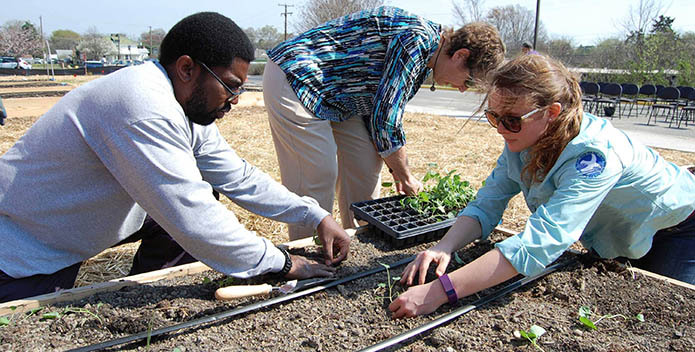 Students and local residents learn while volunteering at the garden, and the church also offers workshops on how to care for a home garden. The idea is catching on so much that last summer locals started a contest to see who could grow the biggest tomato. Churches are ideal places for these types of efforts, said Chesapeake Bay Foundation Outreach and Advocacy Manager Ann Jurczyk, who worked closely with Second Baptist on the project. "Increasingly, the faith community has shone light on issues that need to be addressed. Sometimes, those issues are close to home—like being able to provide fresh fruits and vegetables for growing children. Sometimes the issues are more regional, national or global," Jurczyk said. "If all of us, as people of faith, do all we can to be better stewards of the planet, our collective impact can be tremendous. If every member of the congregation installed one rain barrel or reduced their fertilizer use—we'd be one step closer to clean streams and a restored Bay." Churches can choose to be good stewards of the land, Hodge said. "God will hold us accountable. If we know better, we have to do better," he said. "Should we be growing and building, or should we be destroying? Should we be managing and taking care of, or should we be polluting? We've all got choices to make."